This time, we put the power in your hands. 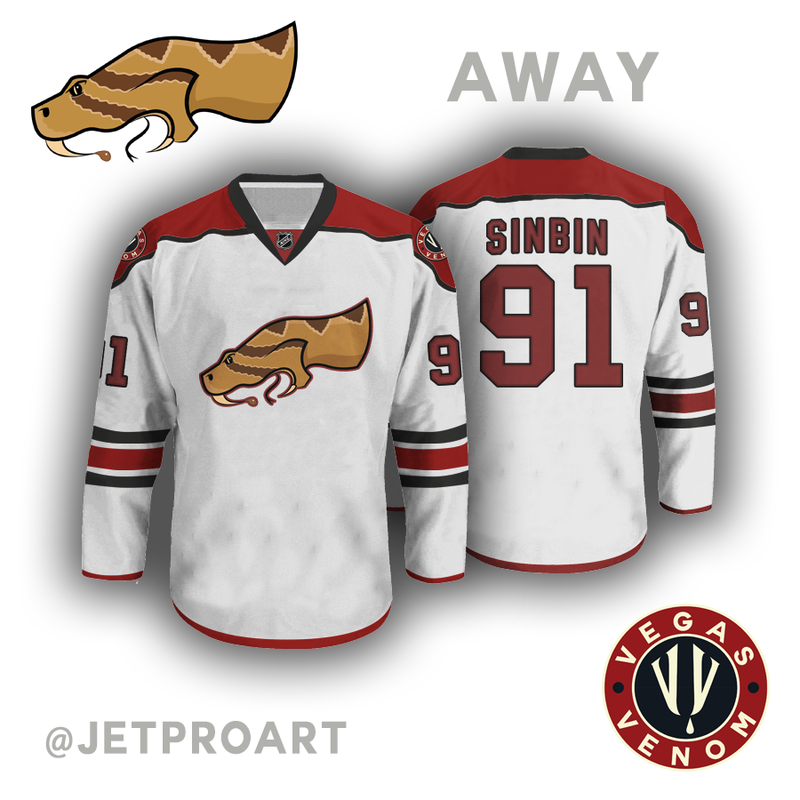 Through a series of Twitter polls you all elected Las Vegas Venom as the next jersey concept on SinBin.vegas. Once again, Isaac took the name, created a logo, and worked his magic making these wonderful looking unis. 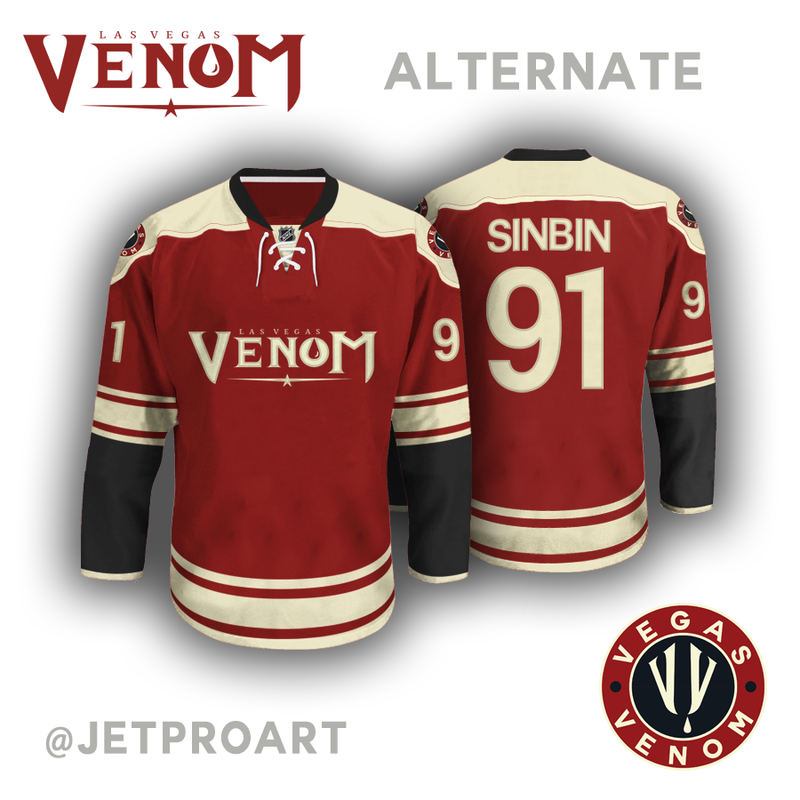 Without further ado, I present you, The Las Vegas Venom! First off, all three logos are spectacular. The drop of venom dripping from the Double V in the circle logo is a great touch and the same goes for the drop in the “O” in Venom. There’s also just something special about that font, it screams snake bite to me, which is weird, because that’s not something computer fonts usually do. There’s certainly a desert feel to the jerseys but they also use colors and that deep red would look awfully nice on T-Shirts, sweatshirts, and hats. The closest thing in professional sports to the Venom is the Diamondbacks, who just changed their jersey’s themselves. Also, I absolutely love the singular name. Venom would be the fourth single name in the NHL joining Wild, Avalanche, and Lightning…all pretty solid names in their own right. As always, major props to Isaac Palestino for the design. Nailed it once again. 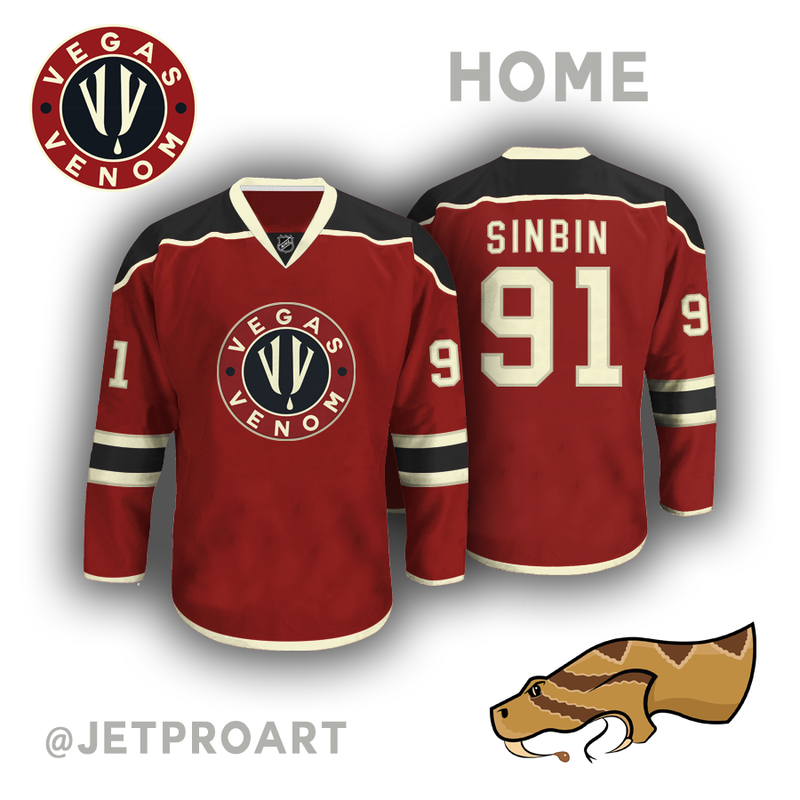 To see the rest of the SinBin.vegas Jersey Concepts hit this, or press the link located permanently at the top of the page. Like it overall, but the home sweater reminds me (a lot) of MN Wild. I’d also like to see what the away logo looks like rotated ~45* clockwise. Right now, the snake looks like it’s attacking the ground. Making it more vertical would seem to offer a more striking pose. Big points for that home logo, though. That’s a pure home run. UGLY!! same colors as Arizona too. Great concept BUT it is a bit reminiscent of the Desert Dogs jerseys. Like the rattler would kill the coyote, right? That snake head looks like a creepy hand… I reminds me of this movie I saw where guy had hand come to life… Needless to say I never let my hand outside a window since in movie he lost his that way. It does look too much like the Wild jerseys which would be an issue. The name isn’t bad, if they used a snake head I’d rather it be like its going to bite me… Instead of a side view, more right in face… There a band Venom I used to listen to that had some pretty cool artwork if then went in that direction :). Not that it matters though I think the double V would look better combined… So its like either crossed to have the double V imagery or like combined into 1 V that has almost a pitchfork like tip/arch. Besides that simply writing Venom looked better than other gear… Yet its probably more geared for AHL/ECHL over NHL level :). The V’s are not connected because they are fangs. Snake fangs don’t touch each other. You think the Wild is a good name? That’s literally the worst name in the NHL. I love the Home and the Alternate. Both jerseys and logos are gorgeous. The alternate in particular I am pretty nuts about. The elephant in the room is the Away. I’m not a fan at all of that snake logo or it’s size. I’d like it to have been forward facing. The way the snake is sort of coming from the right side (well, left arm of the jersey) out of nowhere is just really off-putting. 2 out of these 3 concepts are 10/10. Job done very well, Isaac.